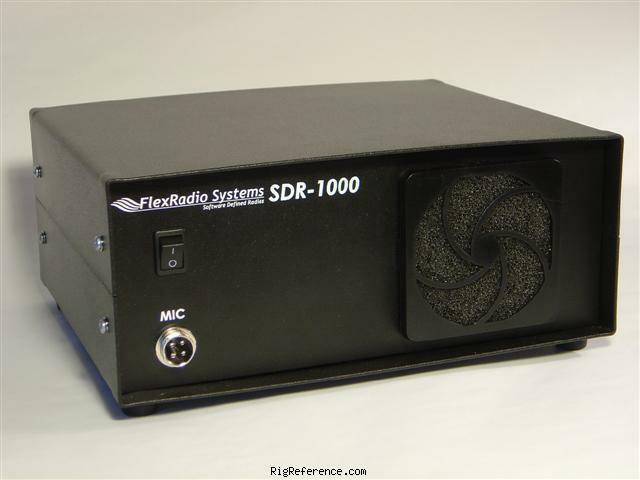 The SDR-1000 was introduced in 2003 and at the time was the first open source Software Defined Radio (SDR) transceiver in the world. The little black box's primary function is to convert RF to a 11 KHz Quadrature (I/Q) AF signal for receive functions and to convert a 11 KHz quadrature AF signal to RF and to amply that signal to 100 watts PEP. Everything else is done in software. The SDR-1000 is controlled via a PC Parallel Port (DB-25 connector) or optional USB-parallel adapter. Every SDR-1000 comes with PowerSDR software that performs all DSP and control functions for the radio. The software is provided open source under the GNU General Public License (GPL). This means that customers have the ability to improve performance and add functionality to the radio with redistribution rights defined under GPL. Estimating the value of a rig can be challenging. We collect prices paid by real hams over the years to help you estimate the current value of the FlexRadio SDR-1000. Just bought or sold this model? Let us know what you traded it for and help other ham operators!